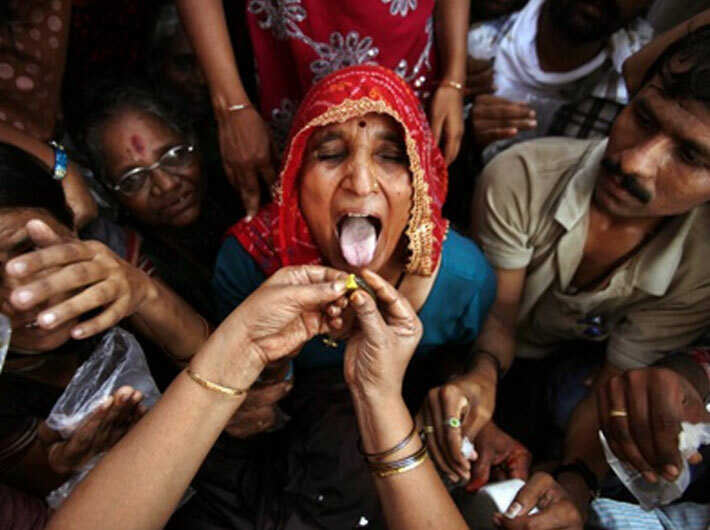 A faithful takes a dose of fish `medicine` – called prasadam – to cure asthma as the two-day annual event got under way in Hyderabad on June 8. Law has prevailed over claims of ‘unscientific’ ritual – at least in this case in Andhra Pradesh. Despite several hurdles, the Bathini Goud family here started distribution of fish 'prasadam' for asthma patients in Hyderabad from Saturday afternoon. The high court gave a breather to the Goud family, as well as thousands of faithfuls who have come here from different parts of the country, hours before the event by staying the lokayukta's ruling that asked the government to stay off the event. The fish prasadam is given during Mrigishira Karthi, which starts in the second week of June. The distribution will continue till Sunday afternoon. Many organisations have tried to have the event barred by stressing that it is unethical and unscientific. The Andhra Pradesh lokayukta delivered a big blow on Wednesday with its observation that the government cannot involve itself in distribution of the fish ‘medicine’; it asked the authorities to not support the event. In his order on Wednesday, the lokayukta, justice B Subhashan Reddy, had said there is no scientific evidence to suggest that the substance handed over in the name of ‘prasadam’ cures asthma. Showing no ebb in faith, people from Rajasthan, Uttar Pradesh, Madhya Pradesh, Karnataka, Orissa, Maharashtra and other states have started gathering in the city since Friday evening. While for some it’s a first, there are those who are on their second or third visits; according to the faithful, asthma patients are required to have the ‘prasadam’ for three consecutive years. Taking shelter under sheds put up inside the venue, patients, especially senior citizens, began forming queues since early Saturday morning. There is no stopping the faithful. Stressing that this is her third visit for the fish ‘medicine’, Jaipur resident Swetha, 65, said she has reaped health benefits of the ‘medicine’. She said her entire family – daughter, son-in-law and two grandchildren – are accompanying her this time. “My grandson has some symptoms (of asthma) so I have brought him here for the medicine,” Swetha said. An asthma patient, Dilip Das of Odisha said he heard about the prasadam from a friend in Delhi and came here with his wife and daughter. He hopes he and his daughter will get relief from asthma after having the ‘prasadam’. According to Bathini Harinath Goud, head of the Goud family which administers the ‘prasadam’, the homemade ancestral remedy consists of a live fish (‘murrel’) stuffed with the ‘medicine’. The state fisheries department has made arrangements to supply 50,000 murrels for the occasion, with each murrel to be sold for Rs 15. Hyderabad police have meanwhile made elaborate security arrangements at the venue to prevent recurrence of any stampede-like situation during the distribution, as had happened last year that left two persons dead. Meanwhile, representatives of Jana Vignana Vedika (JVV) said it would video-record the prasadam distribution and submit it to the court.